The 40th Shinyō Special Attack Squadron, with one-man motorboats loaded with explosives to make suicide attacks against American ships, had its base in 1945 next to Sou Harbor in the northeast part of Kikaijima, an island 380 kilometers south of the southern tip of Kyushu. This is the site of a storage tunnel for small wooden shinyō (also called maru yon) special attack motorboats, which carried 250 kilograms of explosives. Near the end of the Pacific War, the Navy planned to use them in taiatari (crash) attacks against American ships trying to land on Kikaijima. 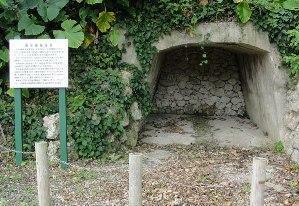 In this area several tunnels located about 50 meters toward the interior were used to store 50 boats. They were also deployed to Onotsu . Along with the Navy Construction Corps (Miyamoto Unit), third-year students from Oshima Junior High School constructed the tunnels. With a system of two shifts per 24 hours, they were completed in a short period of time. On February 11, 1945, soon after construction of the tunnels, the 187 men of the 40th Shinyō Squadron under the command of Lieutenant Sueyoshi Andō were stationed here. The Andō Unit set up headquarters in the mountains at Shiomichi. They waited for orders to make a sortie, but the American task force never approached near. The war ended finally without one boat ever making a sortie. About 6,000 shinyō boats were built by the war's end. The only one that remains is at the War Memorial Museum in Sydney, Australia . According to the history of the 40th Shinyō Special Attack Squadron written by former squadron commander Sueyoshi Kojima , the squadron had 192 total members with 8 officers (including medical officer), 50 shinyō boat pilots, 21 headquarters personnel, 35 maintenance workers, and 78 other base workers. The shinyō boat pilots trained in Nagasaki Prefecture at the Kawatana Torpedo Boat Training School. The 40th Shinyō Special Attack Squadron officially formed on January 25, 1945. The squadron's members originally used the elementary school and civilian houses in Sou Village to live, but these were burned in heavy air attacks. They then moved to stay at the foot of the mountains in crude shelters built with gajumaru (Malayan banyan) wood. The squadron commander's history states that during the war one shinyō pilot and two base workers died and nine other squadron members were wounded. He does not mention how these casualties occurred, but they most likely were during air attacks on Sou Village. Shinyō Association (Shinyōkai), ed. 1990. Ningen heiki: Shinyō tokubetsu kōgekitai (Human weapon: Shinyō Special Attack Corps). Shiro Arai, general editor. Volume 2 of 2. Tōkyō: Kokushokankōkai. 1. The 111th Shinyō Special Attack Squadron, which had 2-man Model 5 shinyō boats, was stationed at Onotsu, which is located on the western side of the northern tip of the island of Kikaijima. 2. The Australian War Memorial is located in Canberra, not Sydney. Also, it could not be confirmed that the museum at the Australian War Memorial has an actual shinyō motorboat from WWII. 3. Kojima is his married family name. Andō was his family name during the war.